So, overall, Abby has done miraculously well so far. Thank you for your prayers! It's still scary stuff and will get worse before it get better but, for now, she is feeling ok. One more chemo infusion Monday at 10am and that's it. The damage will be done, and the healing will start. We have no clue how it will effect her, and it will take another week to really see what it does to her. Mouth/throat/gut sores are the most common with all of this ablative therapy. We're still hoping and praying for minimal side-effects and maximum cancer fighting effects. Unfortunately our Dr. said that this therapy is more like carpet bombing than a precision strike -not the most uplifting picture but he knows what he's talking about. Yet, in the midst of this little war zone, there have been some very sweet and encouraging moments. I'd say the highlight was on Abby's check in day. She had her spinal tap (not the highlight), got her room (a sunny side room, yippee!) 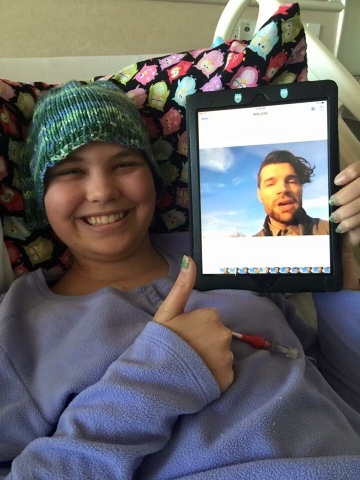 and received a personalized video to Abby from the lead singer of "For King and Country." This was a super special video because the song, "It's Not Over Yet" has been her favorite song lately. I think it's been a bit of an anthem for all of us actually. We heard it twice on the way to the radiation appointment. Then, as we are sitting down in the waiting room, boom, it comes on again. Tiffany I just sat there in silence, tears down our cheeks, but being comforted by the words of the song, "Even when you've hit your limit, it's not over yet, it's not over yet." 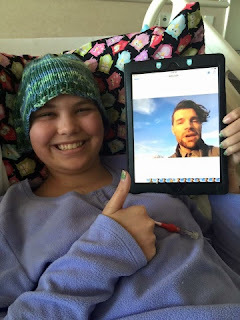 I am honored that this singer would take time to send a personal message of encouragement to my daughter, not just in her battle, but in her faith. To encourage her to not give up, to look up to heaven, and to walk out this journey in faith. Thank you Joel, you are an amazing human being who is really living out his faith. Thank you so much. Wow. On the home front, I feel like I've been carpet bombed a bit too lately. Being sick at home when you just want to be at the hospital with your daughter has been hard. And, at the same time, I'm trying to keep Lily from getting Anna sick, sanitize the house, and rest myself. Sitting at home sick, forces you to think. Though challenging, I guess that is what I needed to do that. It's just been so fast-paced lately. So many appointments in the last 2 weeks. On Monday during Abby's final pre-launch check, I got to sign a form with the doctor that basically spelled out all of the things that could go wrong, why we are doing it, and that I give them permission to do it regardless. I've got to say, that's the hardest contract of sorts that I've ever had to put pen to paper on. This thing may go wrong -initial here. This could also happen leaving your daughter in this condition -initial. These side-effect could last forever -initial. Or it could all work -sign and date. Whew. But, we can't leave her on Mars right? So, you sign the form. You sanitized everything you can, you rest, you take deep breaths. And, you look to heaven. You pray, and you relax into the situation that you've been given. It is what is, but we still have a choice. I have the choice to get mad, to think about throwing things... through windows, like chairs. But I've never had those feelings... and in my imagination of that, it never really works out. So instead, you look for the glimmer of hope and the blessings. You still get sad, you still walk out those thoughts, you still take them to God. One more day. Pray for effective treatment and less side-effects. Thanks again for following Abby's journey. That kid, with the continual smile on her face, really is something special. That's awesome that they would take the time to encourage Abby like that! As I was praying for your family this morning and Abby's chemo God reminded me of who He is: He is the God who parted the Red Sea, used a small boy to kill a giant with just a stone, brought down a wall with trumpets at Jericho, healed the blind and raised the dead to life again. Directing chemo drugs to only cancer cells and protecting healthy cells is just another thing He can do!